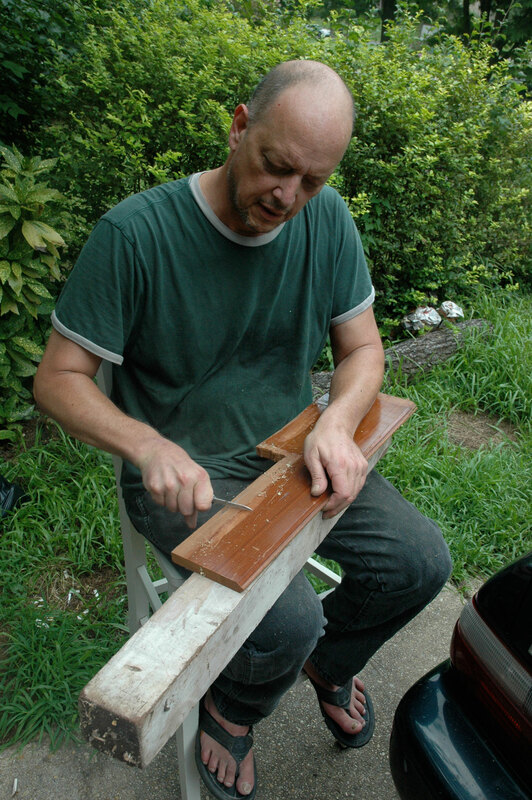 Bill Kinneary, outside his garage workshop in Cheverly, Md., demonstrates how oiling wood can highlight its grain and transform it from flat to three-dimensional. It’s a topic he emphasizes in the workshops on furniture repair and restoration he teaches at Community Forklift. Bill Kinneary’s most cherished mentor was his maternal grandfather. As a child, he stuck to the older gentleman like a shadow when his family spent three months of every year on his grandparents’ farm near a tiny town in northern Italy. It fascinated the young Kinneary that his grandfather—who shared an ox with his neighbor so he could till his land and collect firewood—never seemed to generate any trash because he saw value in even the most minuscule material good. A foot of string? Save it for a repair job. A stray coat hanger? Build a bird trap out of it. The list goes on. And on. Today, observers could describe Kinneary with that same language. The 55-year-old self-taught carpenter carries a refreshing can-do spirit into the furniture repair and restoration workshops he offers on select weekends to all comers at Community Forklift. That message resonated with Anna Filan. The Fort Washington, Md., resident was a Forklift rookie when she appeared at Kinneary’s June workshop with her grandmother’s blue chair in hand. The simple wooden piece had served as a substitute high chair for Filan and other children in the family. Filan inherited it when her Swedish grandmother, who immigrated to the United States at age 20 in 1904, died in 1966. Kinneary figured the chair, which has a maple seat and oak legs, was likely crafted in the 1890s. He offered to take it to his shop in Cheverly, Md., because the rung repair was quite tricky. He completed it in three days. 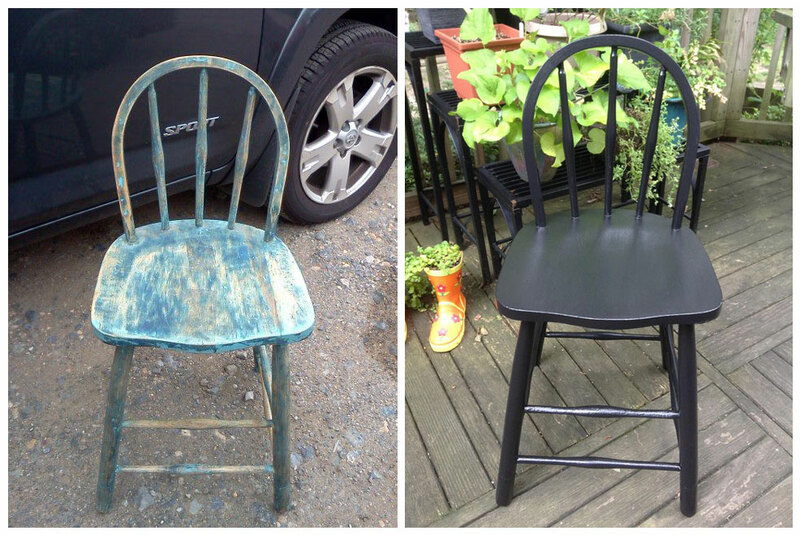 Anna Filan of Fort Washington, Md., was thrilled that Bill Kinneary was able to repair her grandmother’s chair after she attended his workshop at the Community Forklift. Filan’s success with the workshop has sparked her inner artist. Now a Forklift veteran, one of her new hobbies is rehabbing small pieces of furniture and transforming doorknobs and lamp parts into birdfeeders. 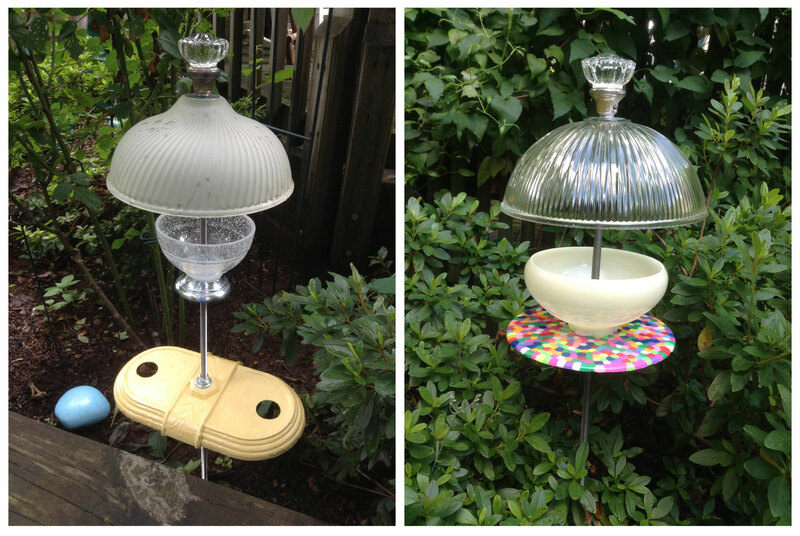 After attending Bill Kinneary’s workshop at Community Forklift, Anna Filan was inspired to create an array of birdfeeders out of lamp parts and doorknobs. That assurance and self-reliance is exactly what Kinneary is trying to encourage in his low-key, self-deprecating manner. He’s aware that not everybody, especially women, grew up satisfying their innate curiosity as he did by taking apart everything from pianos to oscillating fans. 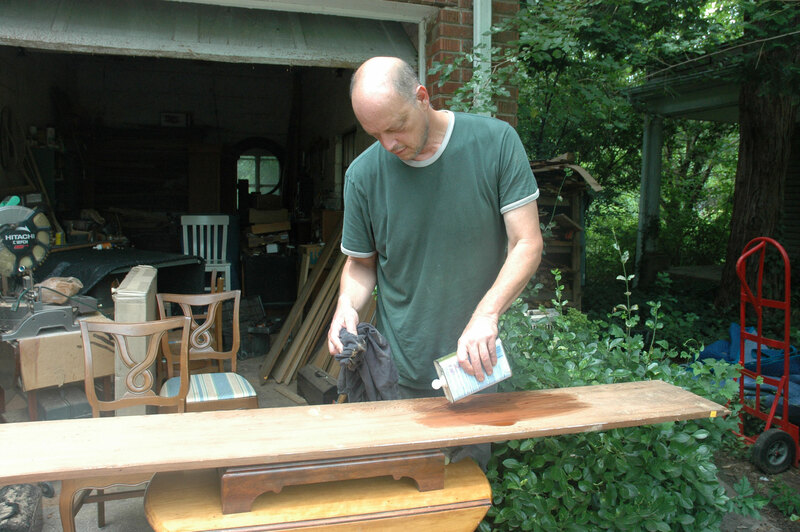 One of the lessons Bill Kinneary teaches his furniture repair and restoration workshop participants is how to use a knife, instead of chemicals, to strip paint from certain pieces of wood. Here demonstrates this skill at his garage workshop in Cheverly, Md. He fondly recalls one woman who came to one of his workshops with a set of chairs. Most of the rungs had separated from the legs and she was convinced she would have to hire somebody to make them whole. Wendy Wu of Bethesda, Md., ferreted out the Forklift several months ago because she needed a lumber supply for her nascent carpentry hobby, where she categorizes herself at a level somewhere between beginner and intermediate. She attended Kinneary’s July workshop to quiz him about a buffet she had rescued from the roadside. It was too heavy to cart to Edmonston, so she showed him photographs. He concluded that it was oak with brass knobs and was handmade not long after World War II. She’s now refinishing the piece. Kinneary also was able to offer Wu perspective on a single chandelier she had crafted by cannibalizing parts from two chandeliers that she had purchased at the Forklift. 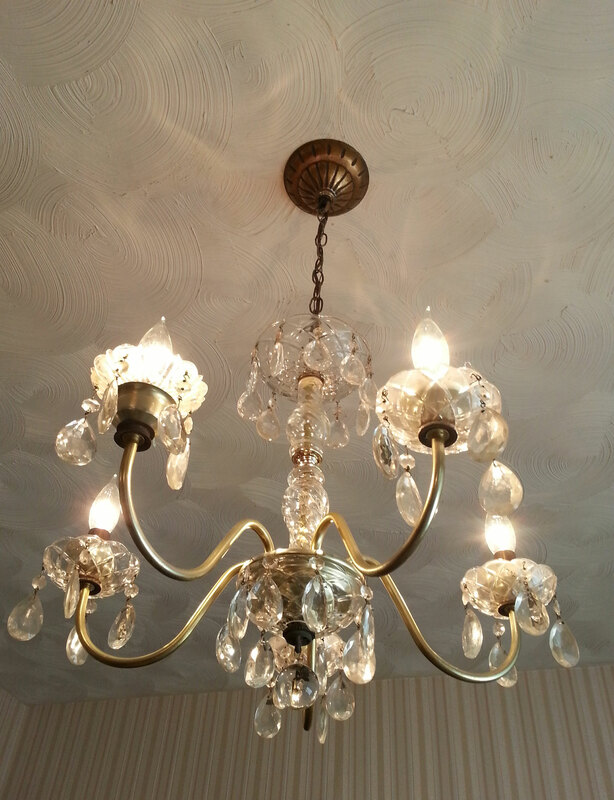 Wendy Wu of Bethesda, Md., figured out how to rewire a chandelier after enrolling in Bill Kinneary’s workshop. This single chandelier, now hanging in her dining room, is cobbled together from two purchases she made at Community Forklift. Despite Wu’s long and demanding hours, the Forklift remains on her “must-do list” as she reinvents the interior of her rental house bit by bit. Kinneary was born in Libya. He’s called handfuls of countries and states home because of his father’s federal government job. 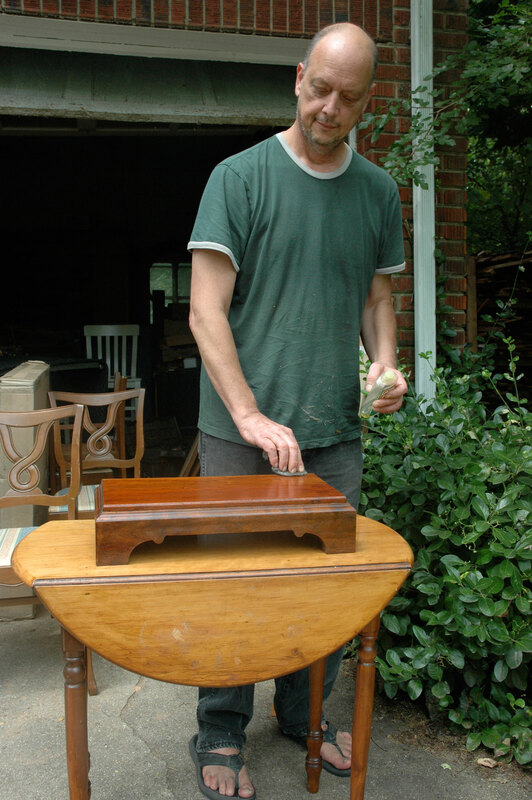 After studying psychology in college and dabbling in multiple careers, he settled on furniture repair several years ago when building stone walls became too physically demanding. He doesn’t advertise his business, BK Restoration, instead relying on word-of-mouth recommendations. His garage workshop is dominated by a table saw, a tabletop sander, a belt sander, a circular saw, a planer, a drill and a lathe. He prefers older equipment because he says it is sturdier and can be rebuilt if a part wears out. He laments that manufacturers and certain television programs have brainwashed people into believing they must acquire the latest and greatest tools to even experiment with basic carpentry. Kinneary also wishes amateur and advanced woodworkers wouldn’t dismiss pine and redwood as unacceptable or lesser species. He purchases most all of his lumber from the Forklift because he knows he can find older wood that has been seasoned in the sun. He has eschewed kiln-dried wood ever since he worked at a mill shop in Italy in his 20s and learned how to dry it “properly and naturally,” he says. One of his goals, whether he is collaborating with Forklift workshop attendees or customers at his shop, is to help them understand and appreciate the exquisite wood craftsmanship that existed before machines started churning out furniture. He becomes quite animated upon showing how a little oil or shellac can highlight the grain and transform a piece from flat to three-dimensional. Kinneary has been a Forklift shopper and donor for years. He had an aha moment about a year ago when he noticed some of the furniture wasn’t selling because it was in disrepair. He figured workshops focused on repair and restoration could help to change that scenario. He floated the idea for his workshop last year after engaging in a conversation with fellow Forklifters about how liberating it can be to Dumpster-dive and then transform a discard into a delight.